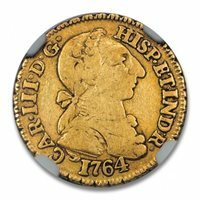 Choice 1788 Vermont Ryder-25, Overstruck on Irish Halfpenny. Mexico. 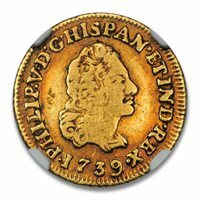 1739/8 1 escudo of Phillip V. F-12 (NGC). Colombia. 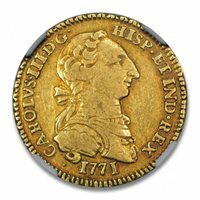 1772-JS 1 real. Popayan mint. Extremely Fine, holed. 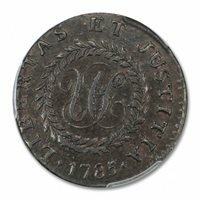 1785 Nova Constellatio copper. Pointed Rays, Script US. Crosby 3-B. AU-55 (PCGS). Mexico. 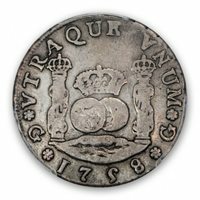 1764-MM 1 escudo of Carlos III. Rat Nose. F-12 (NGC).